Fluence provides standardized and customized ultrapure water (UPW) systems using industry-proven membrane-based technologies, including ultrafiltration (UF), reverse osmosis (RO), gas transfer membrane (GTM) degasification, and continuous electrodeionization (CEDI). These solutions, which meet the most stringent industry site-specific quality targets, are compact, reliable, and provide a continuous supply of high-quality water with a resistivity of up to 16 Mohm/cm (<0.1 µS/cm). Our systems can be custom-designed based on a range of factors including the specific characteristics of the available feed water, redundancy, and the desired quality of the finished product. Our systems can produce ultrapure water for a range of applications, including food, beverage, pharmaceutical, or microelectronics production, as well as boiler makeup water for power plants or any industry producing steam. Using RO and CEDI technology for demineralized water polishing provides customers with operational benefits over traditional solutions that use ion exchange resins. They are environmentally friendly, eliminate the use of expensive regeneration chemicals, and provide the safest process available in the industry. CEDI, to bring demineralized water to the required quality. Fluence UPW systems can be designed to be skid-mounted or to fit inside shipping containers. Our standardized NIROBOX™ product line produces ultrapure water from any source. The Nirobox consists of an ultrafiltration, reverse osmosis, and CEDI system built inside a 40-foot container. Its small footprint, ease and safety of installation and operation, as well as its constant and consistent permeate quality make Nirobox the ideal solution for any industrial customer. How Can We Help Improve Your Operation? In addition to offering makeup water UPW systems to power plants and industrial clients, Fluence also offers condensate-polishing plants (CPP) based on state-of-the-art, mixed-bed ion exchange resins. All Fluence ultrapure water technologies are engineered to match your unique water treatment challenges. Our equipment is ruggedly built, and designed to provide users with extended, trouble-free operation. 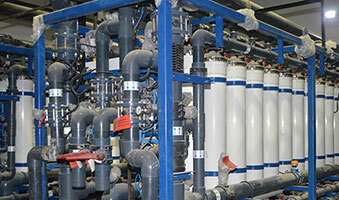 Fluence can assist you in the proper design, layout, and operation of your ultrapure water system. From design to financing, whether it’s a turnkey water demineralization system or an advanced water electrodeionization facility, Fluence is committed to excellence and high-quality service to ensure client satisfaction. Contact our experts with any questions about our ultrapure water solutions, or to request a quote. Contact us to learn more about our industrial water and wastewater solutions, or to discuss your next project with our experts. 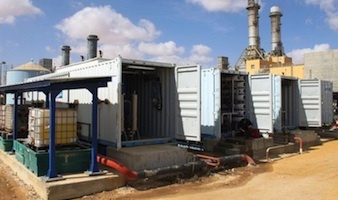 When the Israel Electric Company (IEC) decided to convert some of its inland open-cycle gas turbines to combined-cycle power generation, it needed a high-quality source of ultrapure water (UPW) to use as makeup water for its heat-recovery steam generator (HRSG) and for nitrogen oxide emission reduction. Selected through an international tender process, Fluence successfully designed, manufactured, and supplied containerized UPW systems for several remotely situated combined-cycle power stations. More than 15 production modules were provided, fitted in 40-foot shipping containers. Their compact design allows for ease of installation, operation, and maintenance, while meeting this major power customer’s demanding engineering standards. 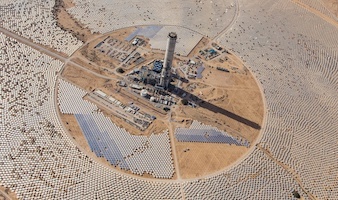 A utility-scale concentrated solar power (CSP) plant in Israel uses sunlight to produce high-pressure steam to power a turbine generator. Brackish blowdown wastewater, which is continuously discharged on-site, must be disposed of in evaporation ponds unless it’s treated for reuse. Our fully containerized solution uses ultrafiltration and reverse osmosis to produce cooling makeup water from the blowdown, and adds second-pass reverse osmosis, GTM degassing, and CEDI polishing to produce ultrapure water for boiler use. For maximum reliability, the system is designed with full-duty standby redundancy, including for the control system. When an Egyptian power plant planned to expand its generation capacity, it needed a source of ultrapure water, and it needed it quickly. In order to use low-quality feed water from the Red Sea, we designed a three-train demineralization system featuring ultrafiltration and reverse osmosis. The first train was delivered in four months, with the second and third following two months later.